naph is a musician, sound engineer, label owner residing in Tokyo, Japan. Following his 1st album "Wind Mill" on Pastel Records (2010), "Autumn Of The Saroos" is his latest album comprised of 2CDs in gorgeous gatefold cover, which is also the 1st output on his new Ambiencephono label. Disc 1 is entitled "Far Sounds" and here, he mainly uses the acoustic guitars and enviromental sounds to create a whole new atmosphere. His very organic approach of producing the tracks is giving the album a special feling with much calm and peacefulness. 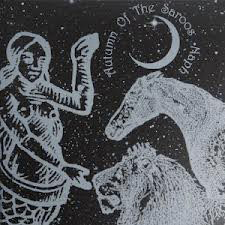 Disc 2 is entitled "Autumn Of The Saroos" and here, he uses the methods of musique concrete which sounds very different from Disc 1 which shows his diversity (he is actually a multi-instrumentalist too) and talent. naph delivers delicate and tender time elapse with his "ultimate" acoustic sounds. He releases his debut album "Wind Mill" on Pastel Records (2010). He is also involved in many bands and collaborations. In 2009, he releases "Decades Away From Home" on P-Vine Records with his band project (with mondii) called RdL. Followed by the release "Flop" which was created among his another band (with Chihei Hatakeyama and Tomoyasu Takanishi) called All The Frogs Are Our Week End. And "Air" which is a genuine collaboration album with Chihei Hatakeyama. He also runs a studio and label in Tokyo called Ambiencephono. As a sound engineer, he has done sound productions and mastering for numerous artists including Tujiko Noriko, Minakumari, World's End Girlfriend.